When working with electrical components or appliances, one thing that must be avoided is contact with electro-static discharge (ESD). The ESD resistant properties of the Ansell HyFlex 11-100 ESD Protection Work Gloves along with their thin, dexterous and sensitive nylon material, make them ideal for handling small electrical components. 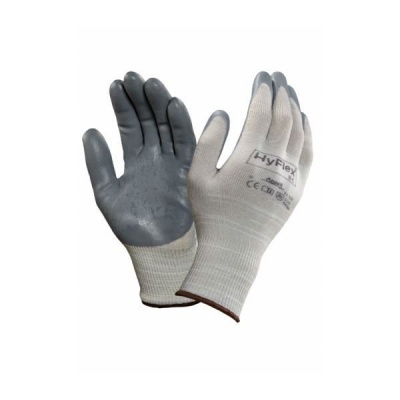 Perfect for electronic manufacture or using with electrical machinery, the qualities of these gloves ensure both protection from ESD, and protection from mechanical risks. The Ansell HyFlex 11-100 ESD Protection Gloves are available in six sizes that should suit the hands of most users. Please measure the circumference of your hand around the knuckles (excluding the thumb) with your hand open and your fingers together, and the length of your hand from the tip of your middle finger to your wrist.